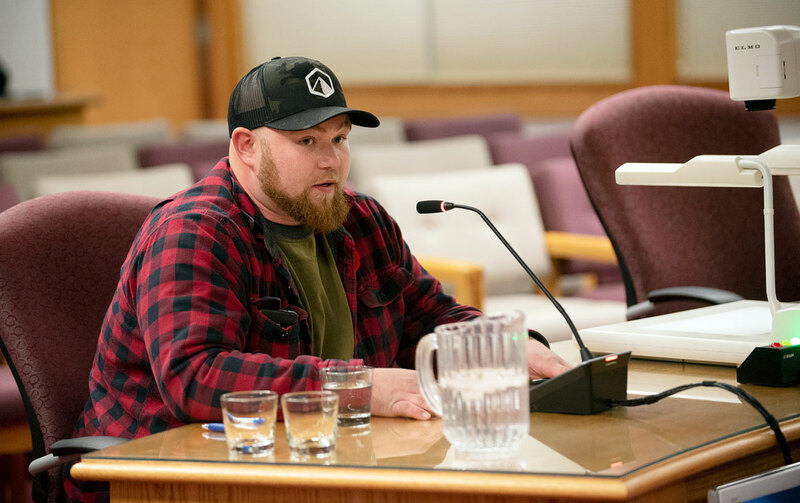 SAFETY IS THE MOTIVE – Daniel Mackenzie of the non-profit Free the Beat Foundation briefs city council with the group’s plans for creating a safe ride program at its Monday evening meeting. Whitehorse residents could enter 2019 with a new option for getting home on Friday and Saturday nights should they be too intoxicated to drive. Daniel Mackenzie of the Free the Beat Foundation presented the new city council with the group’s plans at its Monday evening meeting. The non-profit group has purchased a school bus. There are plans to provide rides by donation between 10 p.m. and 4 a.m. Fridays and Saturdays. It would operate as an app similar to Uber. The limited schedule, Mackenzie argued, will help ensure the proposal doesn’t put a strain on the city’s taxi industry. If everything goes according to plan, the service would begin at midnight on Jan. 1. Mackenzie acknowledged, however, that the proponents don’t quite yet have insurance, as the coverage is a little different from other policies. Efforts are also underway to ensure the bus will have a camera installed. As well, the group is dealing with the RCMP and the three territorial political parties to make the project come to fruition. Mackenzie also said the group will eventually be looking for sponsorship to cover costs from the private businesses and governments. He made it clear though, that his current request of the city is not financial, but for assistance with permits and help from transit department staff who have experience in developing transportation routes throughout the city. The safe ride program would mark Free the Beat’s “first stand-alone initiative”. Mackenzie also noted the group hopes to work with governments on setting up a safe injection site. “It’s needed,” Mackenzie said, noting vulnerable people have nowhere to go. “You can either use a fist in the darkness to punish them, or have a hand outreach to help them. With the major focus currently on the safe ride program, Coun. Samson Hartland encouraged Mackenzie to formalize his request of the city. City manager Linda Rapp recommended that Mackenzie make an appointment to discuss the project so staff can direct and help him with the licences and permits required for service. HEY! All you people who were elected to their present jobs, take a close look here. THIS is leadership! Well done Mr. Mackenzie! I wish you every success in this venture.